This is an entire post about last chances. On what you say? Well everything! I don't know why I have so many "last chance" things to tell you about but I do. Here is a brief posting of everything. The Zonta's Christmas Card Making Extravaganza! There are only a few tickets left for this Saturday's event. It is at the college and it is from 10AM-4PM. Tickets are $40 which includes lunch, a $15 tax receipt and you will walk away with 6-10 projects and a ton of tips and tricks from the pros! Please call the store if you are interested in tickets (more details below). 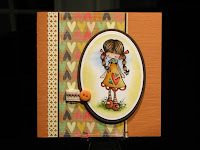 I caught a sneak peek at Kell's card for the event and it is GORGEOUS! Our Clearance Sale! If you haven't heard, we are having an amazing sale on all our clearance items...Take an additional 50% off all clearance, including bling cardstock (now 13 cents! 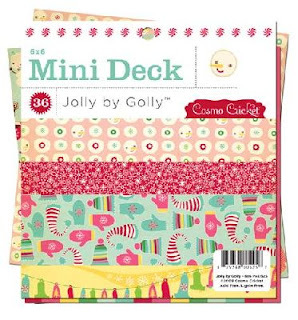 ), decorative paper (4 for $1.00) and many other things. I have just received a close out order I have been waiting for from Crate Paper. This order was suppose to be here at the beginning of the week but you know what this means?! New clearance items for Friday and Saturday! 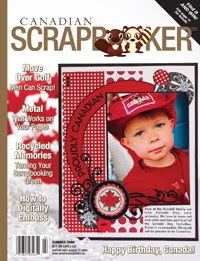 Stop in and check out the discounted paper and chipboard! PS...the new lines from Crate are here too! Tickets! This last chance item I am posting for a friend. She has two Eighth row tickets for the Keith Urban concert at The John Labatt Centre for Thursday, October 1st! She is selling the pair for $250!!! That is a great price (I would hate to tell you what I paid for my 5th row ticket for that same concert!) Kell and I are going to the concert to test and see if her lil' pickle is a country fan! Again, call me at the store if you are interested. Sorry for all the information but I would hate for these great opportunities to pass you by! Do you like sales? Me too! With all the new product arriving lately, I am having a hard time finding space on the shelves so you know what? It is time for a little fall sale. All previously reduced product has been reduced by ANOTHER 50%! We have great scrapbooking papers - 4sheets for $1! All bling card stock is now only 13 cents! All guest books, thank you cards and imprintables are 50% off! 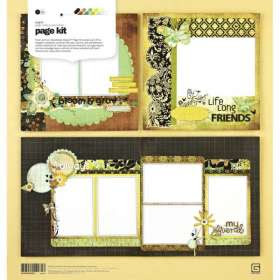 Tons of random scrapbooking and stamping products at up to 75% off! Lots of great product! Stop in and check it out! Sale end this Saturday, September 26th. Um...I hate to report this but we have LOTS of new product at the store! Basic Grey arrived just before lunch today and the new lines are even more fabulous in person. The three new lines are 'Indian Summer' (Autumn), 'Eerie' (Halloween) and 'Eskimo Kisses' (Christmas). 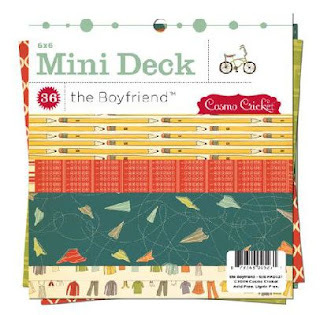 I have never done this before (due to limited shelf space) but I ordered each and EVERY paper from the Indian Summer line because I ♥d it SO. I also brought in the card kits, and complete collection kits. 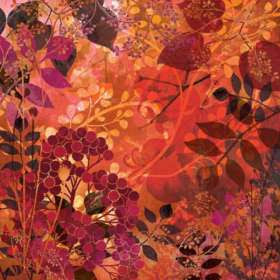 Have a look at this paper....doesn't it just make you smile and think of those warm autumn days that we all treasure? I received a nice sampling of papers from the Eerie line as well as some great clear stamps, card kits, glazed brads and rub-ons. This halloween paper from Basic Grey has just the right amount of 'creep' and 'class'. The Eskimo Kisses collection is just adorable. It has a nice mix of tradition and funk. 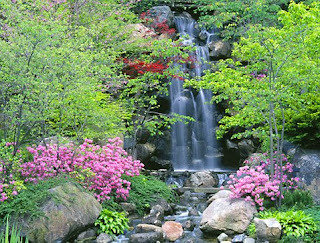 The gorgeous magenta, teals and greens are very nice. A quick call to Kell this morning, to share my news about the order, had her rushing to the store to grab some papers to possibly use for her card for the Zonta Card Extravaganza. PS...there are still tickets available but they are moving fast. Stop in and pick yours up today! I ordered in the brads, card kits, stamps, mini pads, etc. What an exciting day! And this wasn't all...there are still TWO boxes from various companies waiting for me to dig into them!! Can you guess what else may be in store? Now this is the post you have all been waiting for! Our fall classes are about to resume at The Pickle! As always, advanced payment is required in order to secure your seat. You can register for the classes by calling the store 519.351.5220 or stopping in. DO NOT EMAIL. 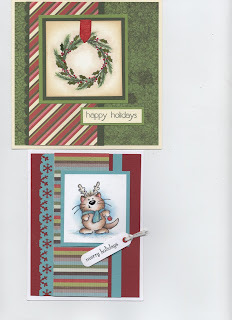 Two great cards and a bonus gift card holder (not shown)...what more could you want? 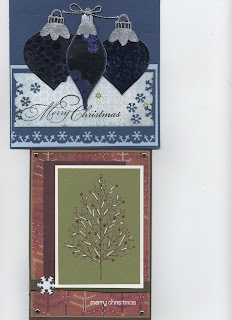 Work with the cuttlebug and embossing folders and nestabilities to create one very elegant card. You will also be paper piercing, working with decorative paper and embossing to reveal a professional looking greeting card that will be amazing for any occasion. 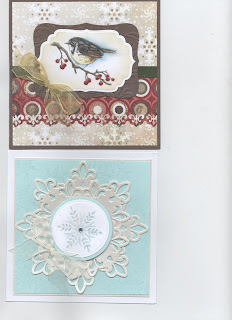 The second card shows how easily a card can come together by using the right papers, ribbons and embossing folders. The bonus project (gift card holder) will show you how to make the most out of all those scrap pieces of paper that you are holding on to! 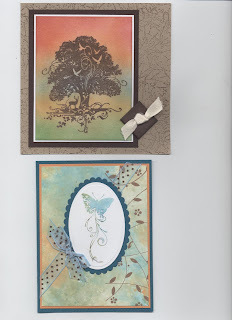 Want to learn how to transform plain white cardstock into works of art? 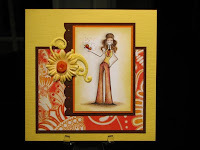 On the first card, you will work with Memento inks to create a gorgeous sunset-type background. 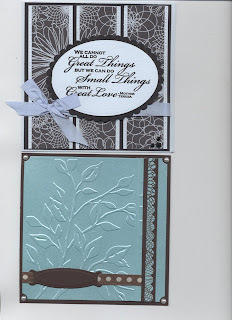 On the second card, you will work with Adirondack inks and glossy cardstock to create beautiful backdrop for your focal stamp. Don't let these techniques scare you....a great class for students of all levels. Looking to learn how to shade and colour like Linda? Well this is the class for you. Linda will show you how to master the Prismacolor pencils. You will also work with Nestabilities, and learn how by adding the perfect embellishments, you will enhance your cards and take them to the next level. For all you scrapbookers wondering why we don't have any classes planned for you, I would ask you to be patient as we are looking for a new teacher that will provide regular two page layout classes once per month. AND guaranteed next month we will have some great classes planned that will be great gift ideas for Christmas. I think I would really like to do a triple canvas (I have the idea in my head but I just haven't got it assembled yet!). Thank you for your understanding! 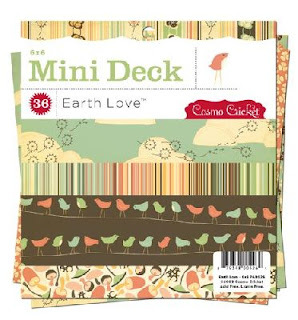 The coolest product for you card makers has to be the new mini decks they designed. They are 6x6 and have 36 sheets of the paper line. I brought in the Earth Love, The Boyfriend and Jolly by Golly collections. These are going to be HOT and quantities are limited. Have I tempted you yet??? I just wanted to let you guys know about an amazing event that is coming up on Saturday, September 26th. 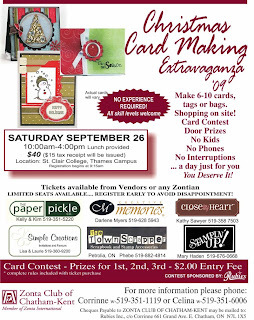 It is the Zonta Club's Card Making Extravaganza...Christmas Style! Check out the poster to the side for details. Basically you will move in small groups from project to project throughout the day learning techniques, socializing and having fun. By the end of the day, you will have 6-10 completed projects and it only costs $40 with lunch included! We have participated in the past and we have had so much fun. I know you will too. Tickets are available at the store. Come and see me with cash in hand and I will get you registered. This is certainly one event you will not want to miss! New Product watch....nothing arrived today but I am hoping to see Cosmo Cricket tomorrow...cross your fingers! I will post news the moment something arrives. 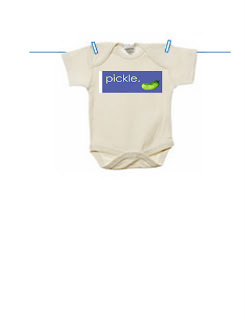 Could this little onesie be any more perfect for a Paper Pickle Baby?!?! I found this a couple of weeks ago when I was out west visiting my sisters, for MY little Pickle! I know many of you have come in this week to find out about the "secret", but if not, Matt and I (Kelly) are expecting our first child around November 14th! A third baby to grow up at the Pickle! I can't imagine a better environment for the child's first year! Thanks to everyone for all the kind words and encouragement! And... I apologize for any moodiness the past two months! I finally feel like me again! So this is our absolute FAVOURITE weekend in Chatham. It is Retrofest and the city is hopping. The weekend begins Friday night with a cruise. Thousands of vintage and classic cars come from all over to show their stuff! You may even see a car like the one to the left. This is a car owned by Miss Florence Pickles (love the name!) 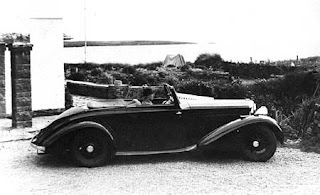 All of her cars were made especially for her with British Racing Green exteriors and green leather interiors. What a woman! Then there is a movie in Tecumseh Park. This years feature is Dirty Dancing....an all time classic. My favourite line of the entire movie is when Baby first meets Johnny and says "I carried the watermelon". Lame I know, but that is what makes it so funny. Gets me every time! Saturday night King Street and various sides streets will be closed and hundreds of cars race to get prime spots to park for the day. Thousands of people come out to see the cars and take advantage of the amazing shopping. Many of the stores are offering TAX FREE shopping. And we are no exception. Stop in any day this week and enjoy tax free savings. 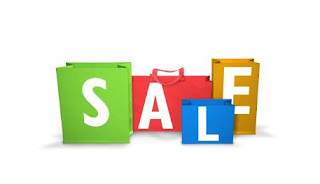 We also have a ton of amazing in store specials including 50% off the lowest price of items in our sales bin. I think I saw some items in there are 85% off! Sunday you can visit the reason why Chatham is called Canada's Car Capital....RM Classic Car Exhibit is opening its door to the public. And for those of you who love "the hogs", stop in next door at Dukes Harley Davidson store. I have to admit I have never been to RM and I hope to venture in this weekend. So for those of you that have never been to Chatham before, why not come and see the city at its best? Grab the keys to your dads MG, put the top down and enjoy the sunshine! 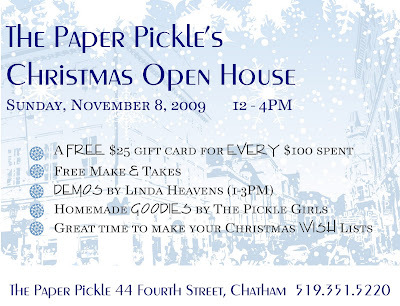 Ans hey, why not stop by The Pickle to say hi....oh yeah...did you hear we had a secret? Just ask Kell what that's all about!